With the success of my easy seven miles on Sunday and four miles today at a slightly faster pace, I want to make sure that I have a plan going into the Las Vegas half. Pending a full hip recovery, the next seven weeks of my life will have a new look and feel. That’s right people: it’s half marathon PR training time. I used a mixture of Hal Higdon’s advanced marathon training, Runner’s World Smart Coach and my own training goals to create the following plan before I got injured, but I still want to print it out, hang it up and try to go after that PR. But please note, if at any moment my hip acts up, I will choose listening to my body before anything else. I have mixed in a variety of cross-training in this plan so should I need to, I can opt for cross-training only, or I can do a double day. Focus on speed: As any running book will tell you, if you want to get fast, you have to train your body to sustain faster paces. This doesn’t mean doing speed work every day, but making sure that I get in one speed/track workout and one tempo run per week. I’m going to start gradually mixing in speed next week, of course, all pending on my hip. Embrace the easy: With a renewed focus on speed, it’s important that you give your muscles time to rest, and in turn, repair the tiny rips that you make in them while training so they grow back bigger and stronger than before. The runs in between my speed work and my long runs will act as easy recovery runs, but will ensure that I’m getting the mileage in. Saturday long runs: As I’ve talked about in the past, Saturday long runs work best for my personal life. Thus, I’ll be hitting the road every Saturday to get in the mileage. Sunday options: I always allow one complete rest day, which will be Sundays in this training cycle. However, I’ve also left the option to do a bit of cross-training as I want to learn how to ride my bike again (gasp)! This will also come in handy should I have to skip a workout mid-week, I can rest assured that another weekend opportunity will abound. Cross training: Every Monday I’m going to take a spin class at my local. Training different muscles and will only help my overall efforts and gives my training a nice change in pace. Swimming: I found a beginner schedule on the Speedo community and will try to stick with it for the next seven weeks. While I realize that this does mean double days (which I’m not usually a fan of), the only reason it is going to work is because Chicken Face will be in grad school on those days. Thus, making the most of both of our time. If I am unable to complete a swim workout, no biggie. The goal is simply to start getting comfortable in the water and de-stress after work. Adjusting to my personal life: As you can see, I have definitely accounted for my personal/work life. The launch of my client’s new product and that weekend that I’ll be working? It’s there. Thanksgiving and increased time with family? It’s there too. So there you have it folks – my half marathon training plan. Let me know if you have any questions and tell me, what are you training for next? next: Happy Birthday Chicken Face! Training plan looks solid. Yay! Pumped to follow your training and watch you chase down that PR. And hey, SEE YOU IN VEGAS. Heyyyy, finally! Someone else who is going for their half marathon PR at RnR Las Vegas! We booked our hotel and flight a few months ago and are so pumped! This is a great training plan. I love that you accounted for your life outside of running and allocated your days based on your personal life. Best of luck! 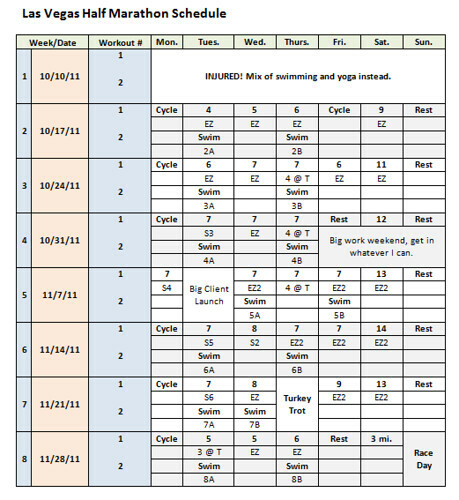 Awesome training plan. I always have a hard time coming up with training plans for myself. I hope you get that PR that you’re gunning for. I like how you made this your own plan! Hope your hip cooperates and you smash your PR. Hope that hips feels good for this PR training cycle! Lately I have been really have to schedule in my runs due to weekend and weekday plans! Its tough but must be done in order to get the runs in and have a mini social life outside of work! I’ve gotta come up with my post-NYC goal. Also, I may be stupid but what do the A and Bs mean in, for example, 7a and 7b? Yeah, Page! Looks like a great plan! I am with you on building the plan around your personal life! 🙂 Looking forward to seeing you out there! Keep me updated on your travel plans! !